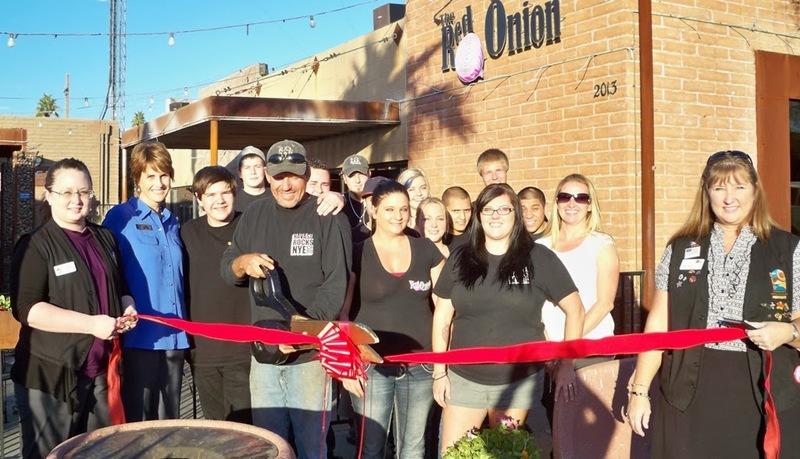 The Lake Havasu Area Chamber Ambassadors held a ribbon cutting ceremony for The Red Onion, celebrating its new dinner hours. Attending the ribbon cutting from left to right were, back row; Daniel Wallace, Zach Kirkwood, Chuck Sargeant, Bryan Brown, Rachel O'Brien, Heather Dunlop, Cesar Delgado, David Orellana, Priscilla Evans, Kyle Finney, front row; Heather Franklin, : Lisa Van Ella, Wyatt Van Ella, Steve Van Ella, Linda Gunther, Rebecca Carpita, and Eileen Reed. The Red Onion will celebrate its six year anniversary in February and is open Monday-Saturday from 7am-close and Sunday 7am-2pm. For more information visit them at 2013 N. McCulloch Blvd.